My trusty slow cooker (pictured here without a disposable liner, but you can see in the next pic that I did use one! )… a couple pounds of short ribs… chicken broth that I didn’t use…. 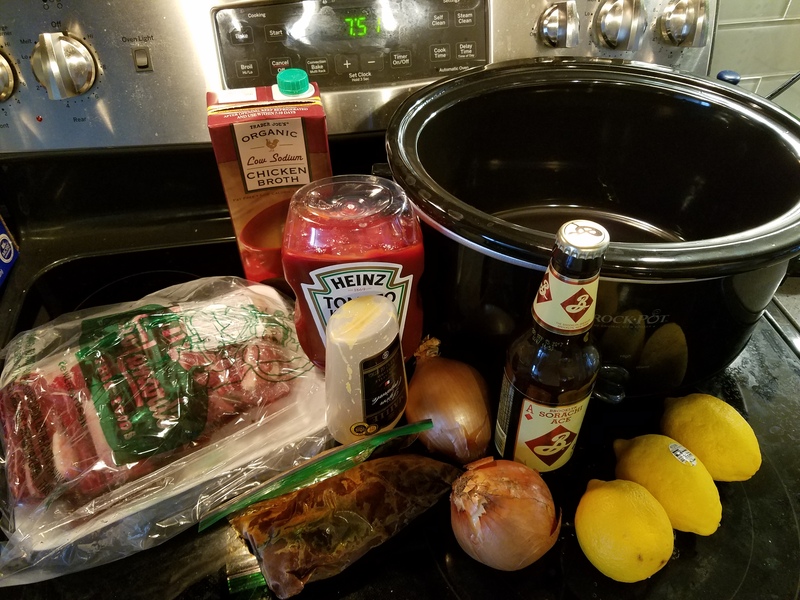 beer, lemons that I juiced, onions, ketchup, mustard not pictured and the brown sugar I added (too much) also not pictured. Oh, and that little bag of frozen red stuff? I thought it was tomato paste. They were frozen chipotles in adobo, which means I later added tomato paste as well. I think they added a bit of smoky taste which Hubba Hubby enjoyed quite a bit, so not a bad mistake, but definitely one of those “it’s too early in the morning and why didn’t I label this little baggy in the freezer?” types of mistakes. I think I also added some cumin — again because Hubba Hubby likes smokiness, my liquid smoke is at the other apartment, and because why not? Here you get a sense of how much liquid everything was. 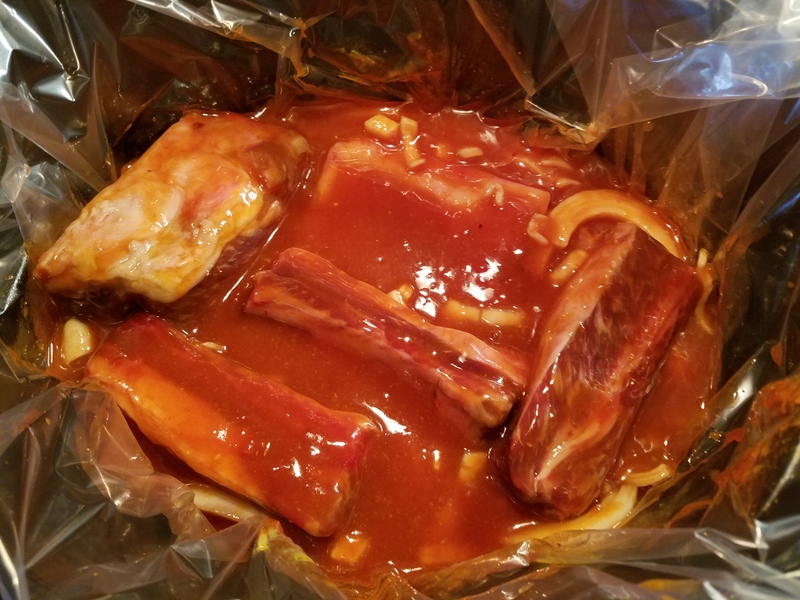 5 bones of short rib, tossed around to coat in the sauce after I stirred everything together. I let this cook on low for about 8 hours. With some regular roasted broccoli and topped with the sauce. Oh– learning my lesson from the lamb tagine last week, after the meat was tender and falling off the bone, I pulled the bones from the sauce, separated the meat into 5 containers (thus the 5 bones — though I think some had less meat than others, so next time I might just try to separate it more evenly instead of by-bone), and poured all of the sauce into a quart container that I let cool on the counter (no lid), then put into the fridge. A thick cap of fat (not flavorful fat, just oil really) formed on top and hardened, so I scooped that off before adding sauce to the lunch containers (you can see some residual fat-globules, the yellow bits in the sauce on top of the meat). 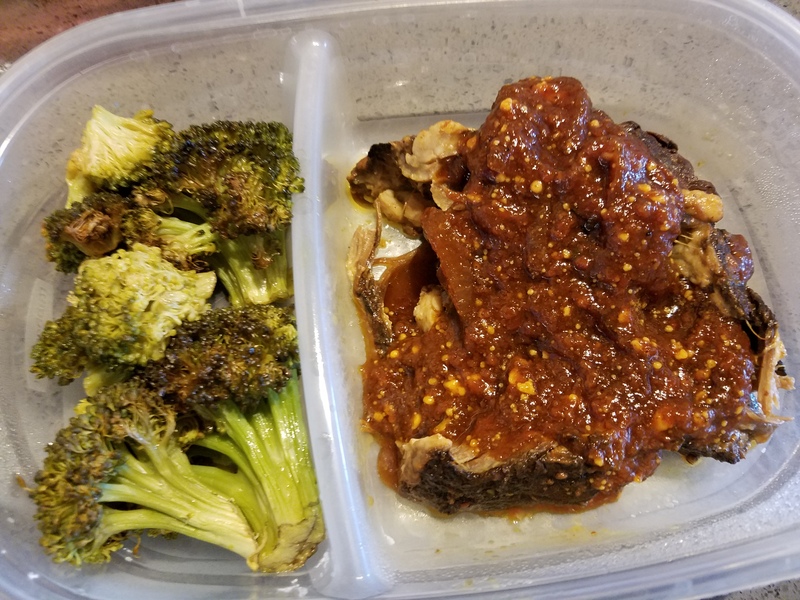 Huge hit with Hubba Hubby – I personally would serve this over rice or pasta, but trying to cut carbs and calories in the lunches led me to leave it just meat + veg. Do you have any perfected short rib recipes to share? 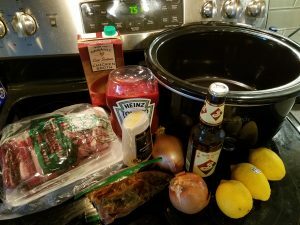 I’ll re-share this one once I figure out measurements for slow cooker! I promise!! I literally season short ribs with garlic salt and pour a bottle of my favorite bbq sauce and let it cook.